I don't dress up for Halloween. My husband takes my kids trick-or-treating, I stay at home, some years I hand out candy, but most years I don't. I don't dislike Halloween, I just am not a fan of the sugar rush that comes with all the candy. I'm a mean mommy, I don't allow my kids candy or junk food. I do bake things at home, but we have very few packaged foods in our cupboards besides rice, flour, and spices. My kids complain that I have only ingredients, but no food, Personally I don't see that as a bad thing. We eat fresh everyday and I make almost everything from scratch (with the exception of cereal which we don't eat, milk, eggs etc.). So on Halloween my kids become candy monsters. As soon as they come in the door, I take their treat bags. Most of the candy goes with my husband to share at work the next day and my kids are only allowed to keep one small plastic bag full of sweets, no suckers or sugared gum (I hate cavities). Honestly, I am looking forward to when they are old enough to want to go to parties and not door-to-door. My family used to eat burgers frequently, but now we only eat them once every couple of months. 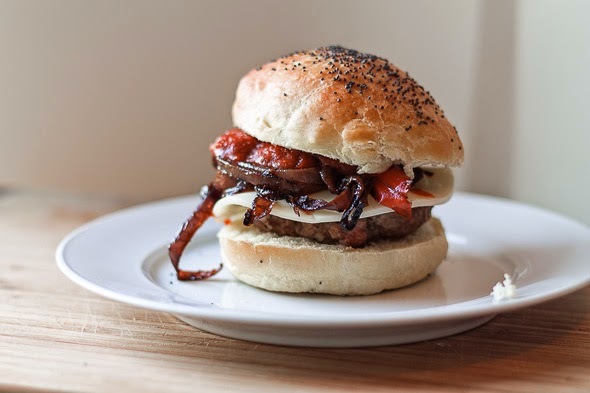 We try not to eat a ton of red meat (my family is finally beginning to love tofu), so when we do eat burgers I try to make them different than the ordinary. 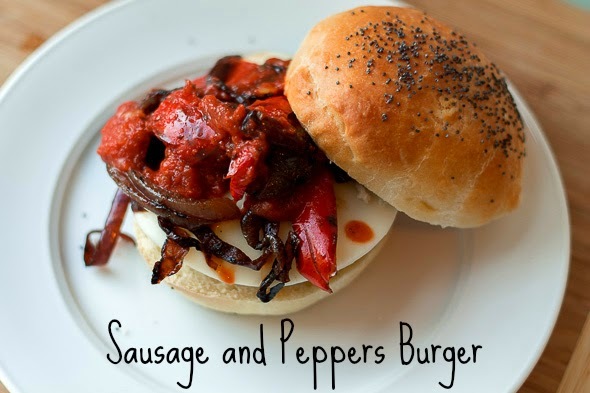 This recipe for Sausage and Peppers Burgers combines two types of meat for a juicy and delicious burger combination. The recipe is as follows. Combine the sausage, beef, garlic, oregano, 1/4 teaspoon pepper and 1.4 teaspoon salt in a bowl. After well blended form into 4 patties. In a skillet over medium heat add olive oil, peppers, and onion. Sauté until peppers and onions are browned and soft, about 6-8 minutes. Preheat a grill (or grill pan) to medium high heat. Add the burgers and cook until browned and cooked all the way through (4-6 minutes per side). Top with cheese for the last 2 minutes of cooking time. Add burger to bun, toping with peppers/onions, and warmed marinara sauce. These burger can be made into smaller patties for children. I make my kids burgers into 1/8 of a pound since they couldn't finish a 1/4 pound burger. If you don't have a grill a grill pan or a skillet would also be fine for cooking the burgers on the stove. I have also tried this with chicken sausage and ground chicken. The taste was different (I also added Greek seasoning), but the flavors were still great together, plus it cut down on fat.